With draft deep at positions of need, will Eagles trade back to acquire more picks later? Deciding which NFL Draft prospects best fit the Philadelphia Eagles will be "an inclusive process," that ranges from coaches to the front office and from scouts to, apparently, the team's young quarterback. But the decision to trade (or not trade) picks, whether that be to move up or down the draft order, will likely be far less inclusive. 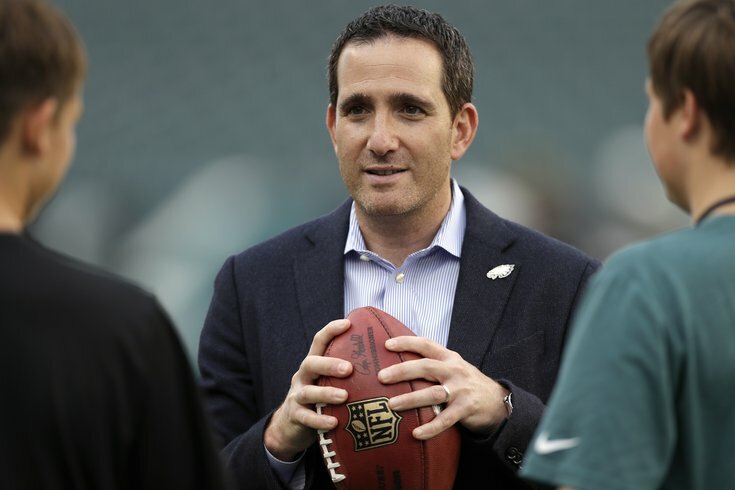 Sure, there may be some input from other parties, but that final decision will most likely belong to Executive Vice President of Football Operations Howie Roseman. Luckily for the Birds, things seem to be lining up well this year in terms of finding an impact player who also fills a need — and not just because there are plenty of positions that could use an upgrade. The Eagles top football executive isn’t alone in his belief that they can find a player who fits, just like he won’t be alone in deciding which player that will be. Their draft board will be set by VP of Player Personnel Joe Douglas — according to Roseman, he’s here to make sure the Birds “don’t make the mistakes [they’ve] made in the past" — but he isn’t the only one. Douglas, like Roseman, sees a lot of potential, not just at this week’s Senior Bowl, but in the 2017 draft class as a whole. But are there enough good players, especially at positions high on their list of needs, for the Eagles to consider trading back from their current spot, which will be 14th or 15th depending on a coin toss? At least three of those positions Douglas listed are, in fact, areas in need of an upgrade. “I think that when we look back and look at our drafts, specifically looking at when we were in the 20s, we’ve had some good success at 20 and higher,” Roseman said. “I think there is a line where you don’t get a difference-maker. This is your opportunity — in the first round of the draft — to find a difference-making player. And that’s our first priority, to bring a difference-maker to the Philadelphia Eagles. “By trading back and getting extra picks, but not having someone who can affect the game — you’re watching the games, watching these championship games, you’re seeing that there are difference-makers making big plays in these games. So we’ve got to make sure that we come out of [the draft] with that. Last year, Roseman identified that line as around the Top 10 when the Eagles moved up from the 13th pick to the eighth. But as we found out later — and he admitted on Wednesday — the goal last year was always to get up to No. 1 or No. 2. • In 2010, they traded up from 24th to 13th to take Brandon Graham. • In 2012, they moved from 15th to 12th in order to select Fletcher Cox. • In 2014, they traded back from 22nd, where the Browns drafted Johnny Manziel, to 26th, and picked Marcus Smith. • And in 2016, they moved up from 13th to eighth to second and drafted Carson Wentz. And of those four, it's the 2014 draft that Roseman singled out when asked about identifying the point at which difference-makers will no longer be on the board. That year, the Eagles had a six players in the top tier on their board, and with two picks remaining before their pick, two were left. After those two players -- WR Brandin Cooks and S Ha Ha Clinton-Dix -- were taken 20th and 21st respectively, Roseman felt comfortable trading back to 26th (and almost did so again before selecting Smith) because the drop of in talent among the next group of prospects was not nearly as sharp. That class, like the current one, was deep at positions the Eagles were targeting, so perhaps we could see a repeat of 2014 on the steps of the Art Museum come April 27. Can you imagine Roger Goodell stepping to the podium in front of a Philly-heavy crowd for the first time ever and announcing that the Eagles have traded back? Since it's an odd-numbered year, historical data suggests that the Eagles will stay put in the middle of the first round. But with Douglas now overseeing the team's draft board -- specifically the talent evaluation part of it -- there's more to it than that. There's also plenty of time for things to change in the three months between now and the NFL Draft. And that draft board sill has a long way to go.